I remember the Video Backup System for Amiga advertized in Polish computer magazines of late 90s, "store hundreds of diskettes on a single VHS tape!" I seriously considered buying it (and a VCR since I didn't have one...) before I got my hands on a cheap CD-ROM drive - and to this day I don't know what I have missed and if I should regret or be happy. First, let me ask the solid objectively answerable question: it connected by SCART or RCA (composite video, "phono plug") to the VCR, but what interface did it use on Amiga side? It didn't have any built-in video, or analog inputs, so the analog data had to undergo some rudimentary conversion to digital in hardware (before being passed through Reed-Solomon Error Correction program running on Amiga). What was it? ...and then let me ask for comments, how did it work out in practice (as "user experience") - because I never knew anyone who used it, and I wonder if it was half as good as the hype in the ads. Based on the images here, it appears the VBS used a combination of the composite out and the DB25/RS232 connector on the Amiga (as well as a connection to the monitor) to operate. I didn't own one, so I'm just interpreting the connection diagrams. LGR (Lazy Games Review) just published an excellent review of a related VHS backup system for the PC, known as the Danmere Backer. See video on YouTube. While I don't have any experience with the VBS for Amiga, it is shown briefly in the above video, and it appears to be similar to the external version of the Danmere Backer. 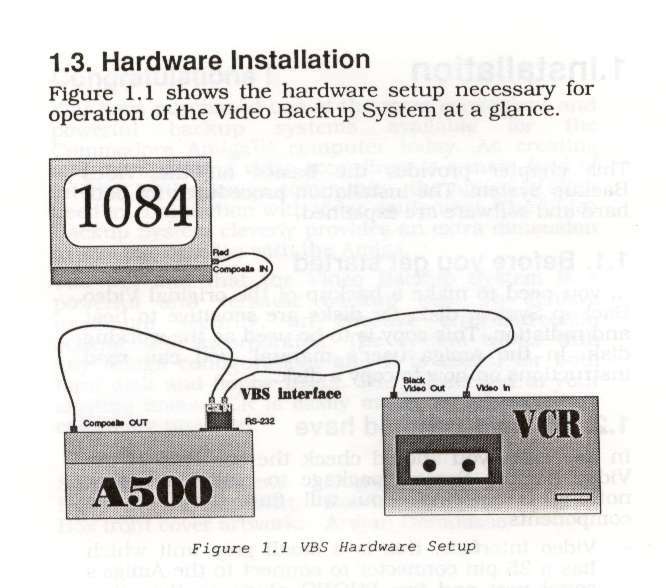 According to the BBOAH page, the Amiga VBS plugged into the Amiga serial port, and the two RCA jacks on the VBS were plugged into the composite video in & out on the VCR. There would be no reason to connect the VBS to your monitor, unless you just wanted to groove out to the funky monochrome video encoding of your backup data. Using VHS/MiniDV/CompactCassette as digital data storage?